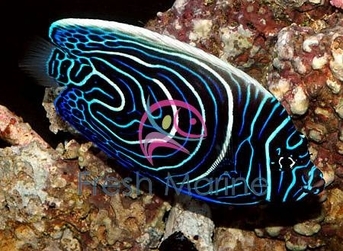 https://sep.yimg.com/ay/yhst-33477391359232/emperor-angelfish-juvenile-pomacanthus-imperator-imperator-angel-fish-10.jpgEmperor Angelfish Juvenile - Pomacanthus imperator - Imperator Angel Fish ModerateSemi-aggressive135 Gallon15 inchesYes, with CautionOmnivore, Greens, Pellet, FlakeCentral, Western Pacific Oceans; Red SeaPomacanthidaeSmall 2" - 3"
The Emperor Angelfish has a unique and spectacular pattern that can be recognized by hobbyists and non-hobbyists alike. The Emperor Angel is a stunning addition to any aquarium system. In captivity it will feed on many types of food. It should be given a wide variety of foods to ensure that it has a balanced diet to meet its nutritional needs. This is a relatively non-aggressive fish, however, adults become territorial and only one should be kept per aquarium. Even in captivity emperors seek out, and seem to prefer the comfort of shelter. They will seek out boulders, caves and coral niches. They tend to do best when offered the possibility of retreat. As with most larger angelfish, the Emperor Angel is not consider to be reef safe. The Emperor Angel is easily distinguished from other fish by its pattern of numerous horizontal yellow stripes, which are seen down the side of its body. As adults, the Emperor Angel is a medium to large fish, and is suitable only for larger aquariums. Juvenile Emperor Angelfish have different patterns from those of the adult. The juvenile's body is dark blue with white stripes and circles. The Emperor Angel is found throughout the Pacific Ocean, Indian Ocean, and even the Red Sea. They are almost always associated with coral reefs in the wild. They are seen in varying depths, from shallow water to areas 100 feet deep. Recommended Tank Size: The Emperor Anglefish requires a 100 gallon or larger tank with live rock for grazing and hiding. It will nip at stony and soft corals (sessile invertebrates) and clam mantles, but may be kept with small-polyped stony corals and somewhat noxious soft corals. Origin: Found mainly on protected shoreline reefs with rich growth of hard and soft corals in waters from 3-15 meters deep. It can be found in the Western Indian Ocean from the Red Sea and Gulf of Aden, south to Zanzibar. Specific Care Information: Angels are sensitive to "new tank syndromes". They should only be placed in systems that have been seasoned for a few months. Good water quality must be optimized and constant. Vigorous circulation and removal of metabolites is also important. Use a good quality salt mix, at a 1.022-1.025 specific gravity and maintain pH in the higher range, 8.2-8.4. A protein skimmer is a must. Diet: Feed a varied diet of Spirulina and other marine algae. Include meaty marine based foods such as mysis shrimp, raw shrimp, and commercially prepared angelfish formulas. It is often said that when juveniles change to their adult coloration, they are never quite as vibrant as when they change color in the wild. Because of this, it is also recommended to also offer vitamin enriched foods that enhance color. Breeding and Propagation: Emperor Angelfish are very difficult to breed in captivity.